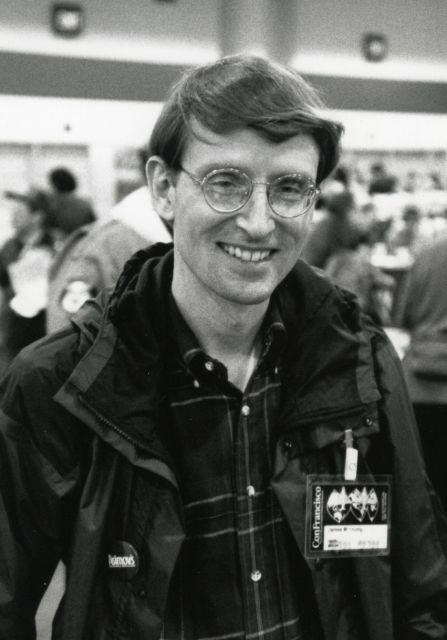 Jim Young at the 1993 World SF Convention, Confrancisco. Photo by © Andrew I. Porter. Jim Young, who helped make Minneapolis fandom legendary, died peacefully on June 12 around 11:10 a.m., a week after emergency surgery for a malignant brain tumor. He never regained consciousness. He was 61 years old. Jim was present at the creation of MN-Stf, The Minnesota Scientifiction Society, in 1966. He “did nearly everything” at the first Minicon in 1968 remembers Fred A Levy Haskell. Even Minicon’s famous blog was rumored to have originated as a punch recipe learned from his mother. Jim was the original spearhead for the Minneapolis in ’73 Worldcon bid. Having been lucky enough to lose to Toronto, Minneapolis fans never stopped throwing bid parties. Jim’s career in the State Department’s Foreign Service took him to Botswana, Russia, Nigeria, and England. After retiring as the U.S. Coordinator for the Organization for Security and Cooperation in Europe (OSCE) he moved to Southern California and worked tirelessly to break into the entertainment industry. As he stood there waiting for his lower brain to stop broadcasting retaliatory lizard thoughts, it occurred to him that this was a message loaded with semantic interference, a veritable Cadillac of cognitive dissonance. Jim’s final two published stories were “The Whirlwind” in F&SF (Jan./Feb. 2011) and “Spamhead” in 10Flash Quarterly (March 2011, full text available free here). In one of my last conversations with Jim he said he had a novel on submission with Tor. And last year we exchanged e-mails as we both hoped to get a story out of his latest role – he played Adolf Hitler in Nazis at the Center of the Earth (under the name James Maxwell). Jim was waiting on a green light from the director, in whose good graces he naturally wanted to remain. For whatever reason we never got that done and the project went straight to video this spring. I’m sorry I didn’t get to write that up, and the rest of the stories that might have come from the acting career he enjoyed so much. This entry was posted in 70s Fanhistory, In Passing and tagged Jim Young by Mike Glyer. Bookmark the permalink. All sympathies to his family and friends. A similar thing happened to my paternal grandmother, who never woke up after brain surgery, either. Oh, how Jim howled about that! Thank you, Jim, for some wonderful memories, your stories, and your piano playing. He did indeed have a novel (in fact, a trilogy) on submission to Tor and I had every intention of publishing it. We never formalized the deal and started the revision process because of health issues on my side, but Jim was unfailingly kind, patient, and understanding about that. Of course, we both thought we had plenty of time . . . I can’t begin to describe how guilty, sad, and cheated I feel. But that pales into triviality compared to how unfair fate has been to Jim and, by extension, all of those who loved and will miss him. Jimmy Young is my cousin, and I loved him and will miss him very much! Michael Swanwick posted a tribute to Jim Young here. Al Porter’s great commentary on the life of Jim Young really brought back memories. Jim was more than the prototype of the gosh-wow-boy-o-boy science fiction fan. In his teen years he was the kind of fellow that Alex & Brett Harris talk about in their book “Do Hard Things”. Not many 17 year olds will walk into a hotel manager’s office to negotiate a convention contract! I’m sure that his drive, energy and, yes, even his diplomacy did much to shape Minn-Stf and all of fandom. As hard as it was to bow out of the Minneapolis in ’73 worldcon bid, Jim’s masterful effort to do what was best for fandom as a whole has established a tradition which will be remembered for many years to come. I only hope that future generations of Americans will be able to take up the torch of freedom the way he did for the USA: with enthusiasm, hard work and striving to do what is best for all.